Ol’ Robbo spent some time this afternoon putting together the first of the Port Swiller Manor Advent wreaths. I’ve used the same donut frame of brass ribs for years now. Fill it with fresh-cut fir and holly from the grounds and one can produce quite a nice effect, especially if the hollies are having a good berry years (which ours, for whatever reason, are not) and if you can find some fir branches with nuts on them. Add candles sitting atop a little mirror and hey, presto! I say the first of the wreaths, because it’s my experience that they last about two weeks before drying out too much. This year as I stood at the kitchen table cutting and planting, I repeatedly had to shoo away the young kittehs, who took a very lively interest in these strange, new green things. It occurred to me that this will also be their first encounter with a Christmas tree. Given their propensity to get into everything, I must say that I’ve got a baaaaad feeling about this. Indeed, I’m reminded of an old Top Ten list that Letterman did (back when he was nominally funny) of modern Disney movie remakes. One of them, which always makes me chuckle, was entitled “That Effin’ Cat”. Speaking of such things, regular friends of the decanter may wonder how the relationship is going between the two kittehs (who must be about four or five months old now) and the middle-aged incumbent? Well, the elder still hates the younger two. Early on, we had to spend an awful lot of time and energy keeping them apart. However, now that the younglings have got big enough to defend themselves and clever enough to avoid the matron most of the time, we’re more disposed to let them sort things out for themselves. I hope each and every one of you, after stopping to reflect and give heartfelt thanks for all the blessings in your lives yesterday, proceeded to stuff yourselves to the gunn’l’s with food and drink and sink without a trace. I can report that despite the alarums and excursions at Port Swiller Manor reported below, we managed to achieve this up to a point, Lord Copper, and that all appears to be well again. So I pretty much spent the day loafing about, reading, drinking tea, fooling with the cats and dozing in front of the fire. * A non-sequitor nod to a ridiculous teevee moovie that caused so much stir in the lib world in anticipation of its airing that “crisis counselors” were on stand-by lest people were so traumatized by the premise that they might be thinking about taking their own lives. At the time of its broadcast, I was a freshman at the People’s Glorious Soviet of Middletown, CT. There had been much pre-showing ballyhoo on campus among the usual bed-wetting suspects, but all I know is that, by about 45 minutes in, the crowd in the lounge in which I was watching had grown bored and were starting to laugh, cat-call and critique. * Also a nod to the fact that I particularly cannot stand the employment of the word “after” as a dangling preposition. I’m always reminded of Judy Holliday testifying about her no-account husband in Adam’s Rib: “So I asked him, ‘Aintcha comin’ home aftah? '” Dunno why, but that usage always causes my gears to grind. M.G. : Dad? You know what? M.G. : You’re a Cat Person! Self: Wha, Wha, Wha, WHAAAT? M.G. : It’s true! You call the kittens “baby” and “precious” and “sweetheart”. I’ve heard you! Self (flustered): Well….they’re our pets. Of course I’m going to be as nice as possible….. M.G. : Ha! You use baby-talk. And you’re always stopping to pet and scratch them. You are definitely a cat person! Self: Nonsense. As I’ve often said, I don’t like cats. But that doesn’t mean I can’t tolerate our cats….. M.G. : Face it, Dad. You’re a Cat Person. I will not dip into the perennial debate over what constituted the “real” first Thanksgiving celebrated in the Americas this year, instead letting the Plymouth dog lie. I can’t help noting my intense amusement, however, in learning that Squanto, savior of the Puritan colonists, was in fact a Catholic. Anyhoo, no posties for the next few days, as the Family Robbo piles into our Honda Juggernaut® at day-break to go visit my brother and his family (together with the Mothe and my widowed cousin). There will be the usual food and drink, grumbling about the God-forsaken state of the world, perhaps some college fu’ball watching (although watching the Longhorns play Tech will never be the same thing as their rivalry with the Aggies), and maybe even a hike up in the Blue Ridge. Good times, good times. Oh, by the way, we did indeed get snow at Port Swiller Manor today. Not many flakes and they didn’t stick at all, but it definitely was the white stuff. The last time we got snow at Thanksgiving, I believe we got hammered later on when the right season started. Just saying. So here’s to a very happy and bounteous Thanksgiving Day to you all, with three times three! UPDATE: D’OH! A month or two back, Mrs. Robbo (while, I believe, practicing bootlegger turns although she denies it) sideswiped a pole in a parking lot, caving in the rim of the right-rear wheel well. The damage seemed cosmetic only and Mrs. R didn’t report any trouble, so I didn’t give it much thought beyond saying kiss-my-hand to the lease deposit. Well this morning, when all five of us plus our luggage piled in (for the first time since Mrs. R’s ding), I quickly discovered that the extra weight meant every time we went over a bump, the rim would scrape against the tire. I tried redistributing the gels to put less of a load on that corner, but it only helped a little bit. We started out nonetheless, but by the time we got to Haymarket, my nerves were beginning to frazzle at each new “SCCCRNCHH! !” I pulled off the road and had a dekko. Sure enough, the edge of the tread where the rim had been rubbing it was starting to shred. No way in the world was I going to try taking that on a six hour drive across Virginny and North Carolina, so we turned around and limped home. I suppose we might have rented something, but the closest place I could even imagine being open would have been Dulles. Maybe. And assuming we could find a suitable substitute, by the time we got there, got it, got home and transferred all our gear, it would be way late to set out. Ol’ Robbo has a very low “Oh, to hell with it!” threshold, and that would have been too much for so short a trip. My sister-in-law suggested I try banging the rim back out with a hammer. I had actually thought about that and even took a few tentative pokes at it. But I don’t know anything about getting a body panel off a car. And I was afraid that if I tried to lever it in situ, I would only manage to tear it, thus putting a shiv directly over the tire. No, thankee. So no Port Swiller Family Meet-Up this year. Fortunately, some friends who found out about it immediately invited us to join them for dins this afternoon. So at least there’s that. UPDATE DEUX: Yeah, about that. In the midst of our frolic the eldest gel was struck down by sharp abdominal pains and had to be taken to teh ER. Kidney stones, apparently. What a day. On his drive home this evening through the Storm of the Century of the Week, ol’ Robbo heard Tchaikovsky’s “Nutcracker Suite” played over the airwaves by the local classkickal station. In all fairness, the spinning of said CD was actually a function of the station’s annual classickal countdown, a survey of listeners’ 100 faves that runs this week and finishes up on Thanksgiving night. Nonetheless, the reminder that, so far as the current so-called cultchah is concerned, we are now entering into the “Xmas” season was enough to cause ol’ Robbo to sprout fangs and hair all over his face and start baying at the moon, wherever she might have been behind the fog, rain and cloud. You see, I know what’s going to happen. I listen to said station both during my commute and during my regular work day down the shop. Starting on Friday, teh station is going to start slipping a few Xmas toons into its rotation. Gradually, over what is supposed to be the season of Advent, they’re going to increase the flow, until round about December 23 or so, when it’s going to be wall-to-wall Xmas musick, most of the tracks having been played some tens if not hundreds of times already. And at that point, should I choose to listen, I’m going to be Absolutely. Sick. To. Death. Of. All. Of. It. People don’t get it. They just damn don’t get it. Well this year, I am not going to succumb. I won’t go so far as to cut out all musick from my work day (as I do during Lent), but I am going to forgo the radio and instead rely on a rotation of my own CD’s brought in from home. I know this is a very small and perhaps futile gesture, but it’s what I’ve got. Ol’ Robbo will tell you two things he’s learned over nearly sixteen years of parenthood. Thing the first: When the gels were just infants, toddlers and kids, dealing with them was very much the undiscovered country. Now that they are all teens and pre-teens, however, ol’ Robbo is suddenly having flashbacks to his own misspent yoot, recognizing himself in their shoes. On the one hand, this is good in terms of empathetic understanding. On teh other, it is bad in terms of the recognition of what a loathsome toad I myself was back in the day. The experience, although edifying, is less than pleasant. Thing the second: For some reason, I always assumed girls were, well, less slobby than boys. Not less cluttered or disorganized, you understand. Instead, less slovenly, less unclean, less casually nasty, less apt to trash up a bathroom with…well, things that need not be mentioned on a family blog (with which I had to deal tonight after a nearly two hour homeward commute because nobody else apparently gave much of a damn). As regular friends of teh decanter may recall, Mrs. R and I spent multiple thousands of jimmy-o’goblins this past summah in renovating and upgrading teh gels’ bathroom. Considering the way they continue to treat it, I ask myself whether such investment really was worth it. Truck stops ain’t in it. Amidst all the lamentation over the 50th anniversary of the death of St. Jack of the Blessed Bay of Pigs FUBAR, I feel it important to note that another man who died, albeit under very different circumstances, on the same day was Clive Staples (“Jack”) Lewis. Regular friends of the decanter used to ol’ Robbo’s religious pretensions may be surprised to know that, until I was a first year law student way back in the winter of 1988, I’d never even heard of C.S. Lewis. But that Christmas, my then-girlfriend (from a solidly conservative South Texas Catholic family) gave me a copy of The Essential C.S. Lewis. Well. Flipping through this book, I came across, for the first time, The Lion, The Witch and the Wardrobe, after which I immediately had to gobble up the rest of the Narnia series, reading them over and over again because I loved each and every new story. I also read Perelandra, the middle book of Lewis’s sic-fi trilogy, which I thought pretty cool but rather weird. (I still do after many readings of the entire trilogy.) But beyond that? Eh, at first, I didn’t really explore much. Here was a fellah for whom Christianity emphatically was not just a matter of being nice to people and going to church on Sundays when one felt like it. This was real meat. This was real Christian substance. This was not the proverbial counting of angels dancing on the head of a pin (which for some reason always especially irritated the Old Gentleman any time the subject of organized religion came up), but instead bloody dispatches from the Front in the perpetual war between Good and Evil. 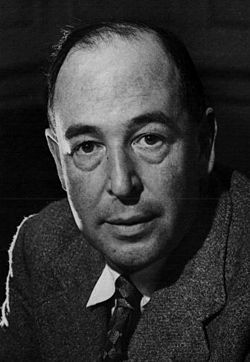 I especially grew to love Lewis’s obvious WWII analogy of Jesus as an agent parachuted into occupied territory in order to prepare and organize the Resistance in advance of the main Allied invasion landing. Over the following years, I tried to apply Lewis’s call to arms in the context of my cradle Episcopalianism. Once Mrs. R and I found a Palie church we both liked, I tried to set about fighting the good fight under its banner in the way that Lewis had outlined. It took a few years of denial, apology and explanation, but eventually I could not resist acknowledging the fact that, carrying on the WWII metaphor, the army I had thought myself fighting for on the side of Goodness was, in fact, Vichy. It was this realization, more than anything else, that prompted me to jump into the Tiber and swim across to the true Resistance. So I was amused today to read this article over at Aleteia about Lewis being a “gateway drug” to Catholicism. I think the piece makes the same point I do, but I also think my Lewis’s own imagery is preferable. So God bless you, Jack, and may you rest in peace. Before it ends, I just wanted to note that today is the Feast of St. Cecilia, patron of musick and one of ol’ Robbo’s very favorite for what ought to be obvious reasons to long-time friends of the decanter. 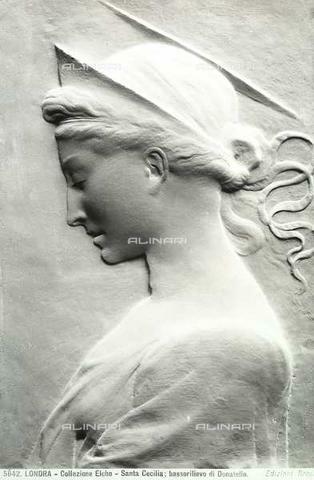 I don’t recall whether I have mentioned it here before, but in fact I have long kept a copy of the famous Donatello bas-relief of St. Cecilia on top of the Port Swiller Manor piano. I do this primarily because when I start to swear at myself over my feeble attempts at making musick, an ancient bad habit of mine, a quick glance at her will often shame me into regaining control of my tongue. I then ask her intercession for the forgiving of my potty-mouth. On the other hand, on those occasions (not surprisingly rare for someone whose maximum practice time consists of maybe an hour or two of sight-reading per week) when my fingers actually start working on their own and I find myself caught up in the soul of the musick, I try to make a point of thanking her for her aid when I’m done. So tomorrow is the 50th anniversary of the assassination of JFK. Well, not to speak ill of the dead, but I will tell you plainly that I have no particular sympathy for the hoopla that has been building up to it over the past week or two among teh Elites. Of course it was an awful tragedy. Of course it was an act of pure evil. Of course it knocked the Nation for six. But all this “The Event That Changed The Course Of History For Evah” stuff? Well, in my humble opinion that’s just Boomer jacking o-……um, hrrmph, well, never mind (you know what I mean), and I am of neither the age nor the temperament to feel any inclination to participate. Next April marks the 150th anniversary of the assassination of Lincoln, an event which arguably had a greater influence on the course of American history by several orders of magnitude. Let’s see how high the fires of homage are piled by this lot then. My guess? Not so much. Oh, and the rhetoric being bandied about (nudge, nudge, wink, wink) concerning what a hide-bound, reactionary nest of hate-filled conservative whacko-birds Dallas was at the time? Let’s remember the simple truth of the matter: Oswald, in addition to being a crackpot, was a Communist. A Fellow Traveler with his visa stamps all up to date. A goddam Red. Nuff said. Oh, and as for the whole “Camelot” thing? I still recall the day I suddenly realized that the imagery had nothing to do with Sir Thomas Malory or Geoffrey of Monmouth, but instead with Lerner and Loewe. At first I was dumbfounded. It had always been bad enough to me to believe that the Arthurian Legend, which I cherish even more now than I did back then, had been so outrageously hijacked by the Kennedy PR machine. But that they were in fact bent on co-opting a modern musickal? Well, that actually began to make sense, albeit in a sad way. Tinsel Age play-acting frippery and all that. Sorry, but the older I get and the more I see, the greater my loathing for politicks. And tomorrow is all about teh politicks. UPDATE: Via teh Puppy Blender, Ann Althouse offers some tips about commemorating teh day, most of which take on the form of shut up, already…. Friends of the decanter may not know from the sort of content that ol’ Robbo offers up here these days that, in fact, he is keenly, keenly aware of the great struggle currently being waged for the heart of our Republic and which will determine its future course either into (pace Winston) broad, sunlit uplands or the abyss of a new dark age made more sinister, and perhaps more protracted, by the lights of perverted science. Well, frankly, I’m just a bit too close to the center of things for comfort. If it were just me myself, I’d say damn it all and sing out from the rooftops. But I’ve got a family to think of and must keep in mind what effect a late-night visit from the New NKVD would have on them. So, like Queen Bess, I take the motto video et taceo. ♦ Last week, I participated in an outreach event with the current third year law class at Dubyanell, my old alma mater. Idly thinking about the math, I suddenly realized it has been twenty-three years since I myself was in their shoes. Good God Almighty, how did that happen? ♦ Something that drives me crazy? When drivers sitting at a long light or in traffic turn off their engines and only turn them on again when things start to move. It’s not so much the start-up time involved, it’s more the knowledge that such practice actually causes more wear and tear on a car’s engine than does patient idling. ♦ This one is really for all of Robbo’s fellow Nats Fans: There are rumors that the Nats are considering dealing Denard Span and/or Anthony Rendon. Jumpin’ Jehosaphat, why? WHY ON EARTH?? ♦ I may not have mentioned before that I am once more plowing my way through Patrick O’Brian’s Aubrey/Maturin novels, having decided to go right the way along to “21” even thought I’ve always felt the series tailed off in quality and spirit after The Wine-Dark Sea. Anyhoo, I pass on for your consideration an observation made by the Mothe: As far as female characters go, she is willing to accept Sophie as plausible. However, she maintains that there is no such real world person as Diana Villiers, and that she is instead the product of male fantasy. I would go further and suggest that Christine Wood is even more so. ♦ Speaking of literary cycles, I have been working my way slowly through the Beeb’s An Age of Kings, the cycle of Shakespeare’s historickal plays running from Richard II to Richard III. All in all, I quite liked it despite the extremely heavy editing. Solid casting all around. Sean Connery made a great Hotspur, Robert Hardy made a Churchillian Henry V and the fellah who played Falstaff was quite good, too. But when I looked at the DVD of all those episodes of Henry VI, parts 1, 2 and 3…..I just couldn’t do it. ♦ We’ve entered the season of that most dreaded of social gatherings, the Office Holiday Party. How it makes me shudder. More than once I’ve used urgent calls with Time & Temperature to waive off office mates who wonder why I’m not headed to the conference room at the appointed time. ♦ Speaking of seasons, my work garage is no great way from Dee Cees’ Verizon Center, home of the NHL Capitals and NBA Wizards. When either team is playing at home, there is an ugly evening crossover of wage-slaves trying to get out while fans are trying to get in. I have observed that when the Caps are playing, piloting the ol’ Jeep up out of the depths takes on the feeling of being a salmon trying to battle upstream to its mating grounds and being confronted by rapids, hungry grizzlies and occasional mountain-slides. When the Wizards are playing? Not so much. And finally, because it never gets tired, there’s this. Enjoy!